KNOW THE ROUTE: An integrated Garmin Zumo 590 GPS with an easy-read. 4.3-inch (10.9 cm) touch screen and Bluetooth wireless technology help you stay in touch and access vital information wherever you go. ROLL IT ALONG: This semi-rigid roller bag fits the Spyder front cargo area perfectly and easily transports your gear at your destination. 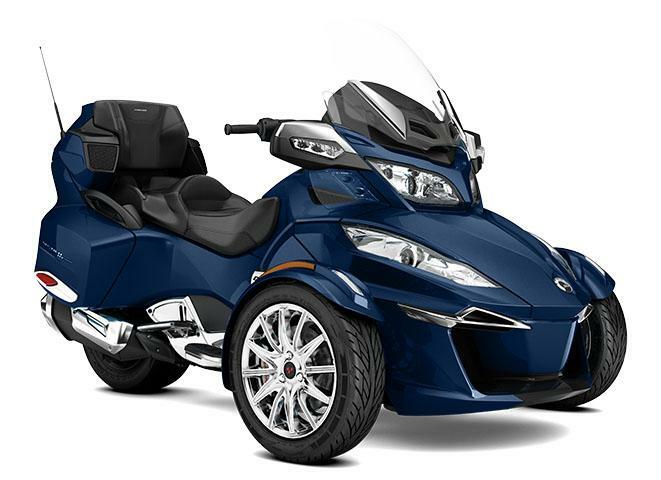 LUXURY AND STYLE: Generous chrome makes the Spyder RT Limited stand out, including 12-spoke wheels, exhaust tip, heat shield, mirrors, and rider and passenger footboards. INSTANT COMFORT: A plush SACHS air shock automatically adjusts to optimize the ride for driver, passenger and cargo weight; you can also fine-tune it on-the-fly to your preferences with a console switch. PAMPERED PARTNER: The Y-frame design creates peace-of-mind, while the ergonomic backrest, adjustable footboards, heated grips and individual audio control pamper them over the long haul. ON-ROAD ENTERTAINMENT: Your favorite tunes are the perfect complement to the open road. AM/FM radio and iPod input drives the 4-speaker audio system. Plus, the passenger gets their own volume control.